Using Sainfoin as a hay and forage crop has become increasingly popular due to it’s longevity, tolerance of root-knot nematode, “bloat-free forage”, and drought tolerance. It can be used for silage or hay and can be grazed. It does not require fertilizer. In areas where hay production is limited to one dryland cutting farmers are replacing alfalfa with sainfoin. Sainfoin is alkali tolerant and does best in soils with a pH of 6.2 and above. It does not tolerate acidic soils. Use Shoshone when combating root-knot nematodes. Shoshone Sainfoin (Onobrychis viciifolia) was selected for it’s tolerance of northern root-knot nematode. It was developed by intercrossing the surviving plants remaining in an irrigated sainfoin variety trial infested with the Northern Root-knot nematode in southeastern Wyoming. It has good drought tolerance, winter hardiness, and is also resistant to alfalfa stem nematode. Shoshone is the preferred variety when sugar beets or other root crops are included in an irrigated crop rotation. It expressed a higher level of tolerance to parasites than ‘Remont’ sainfoin by having greater shoot/root weight and lower plant mortality. Eski sainfoin is slightly more drought tolerant, but shoshone is more persistent and provides better forage and hay. Shoshone was jointly released in 2005 by the College of Agriculture, Agricultural Experiment Stations at the University of Wyoming and Montana State University, and by the United States Department of Agriculture, Natural Resources Conservation Service at Bridger, MT. The variety was named in honor of Chief Washakie of the Eastern Shoshone Tribe. Eski Sainfoin originated in Eskisehire, Turkey. It was selected for winter hardiness in trials at Sidney, Montana and was released in 1964. 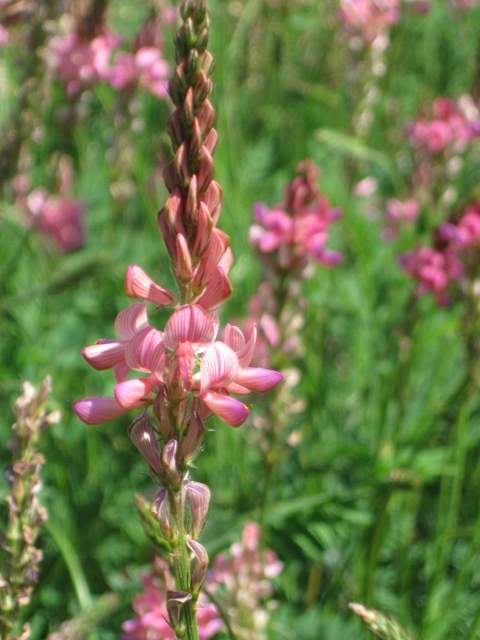 It is the most common sainfoin used in western rangelands. Eski has performed well in pinyon- juniper, mountain big sagebrush, and mountain brush areas. It is recommended for dryland areas receiving at least 13 inches of annual precipitation and irrigated land yielding only one or two cuttings. Eski yields only one to two cuttings per season. 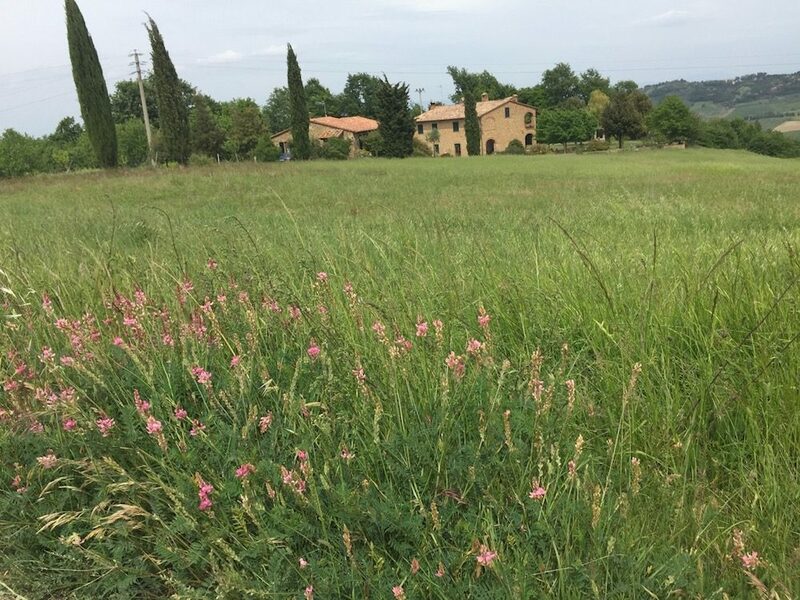 Sainfoin as a hay and forage crop grows taller than alfalfa, its stem is hollow, there are many leaflets (like a vetch) and its flowers, which are pink, are borne on a raceme. The “seed” used to establish this crop is, in fact, a pod which contains a single seed. Even without the pod, the true seed is large (for a legume); there are only 28,000 seeds per pound. Both of our varieties of Sainfoin have good drought resistance and grow well on a variety of soils, they do especially well on high lime, well-drained soils of high fertility. However they do not do well on soils which are wet or have a high water table. All varieties have a low tolerance to flooding, waterlogging or even high water tables and are intolerant of acidity and salinity. Sainfoin begins growth in the spring about the same time as alfalfa, but flowers one to two weeks earlier. 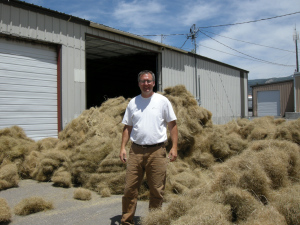 First cutting hay yields have exceeded those of alfalfa in Montana, but alfalfa yields are greater in subsequent cuttings. In areas where hay production is limited to one dryland cutting, or because of a shortage of irrigation water, it may replace alfalfa. 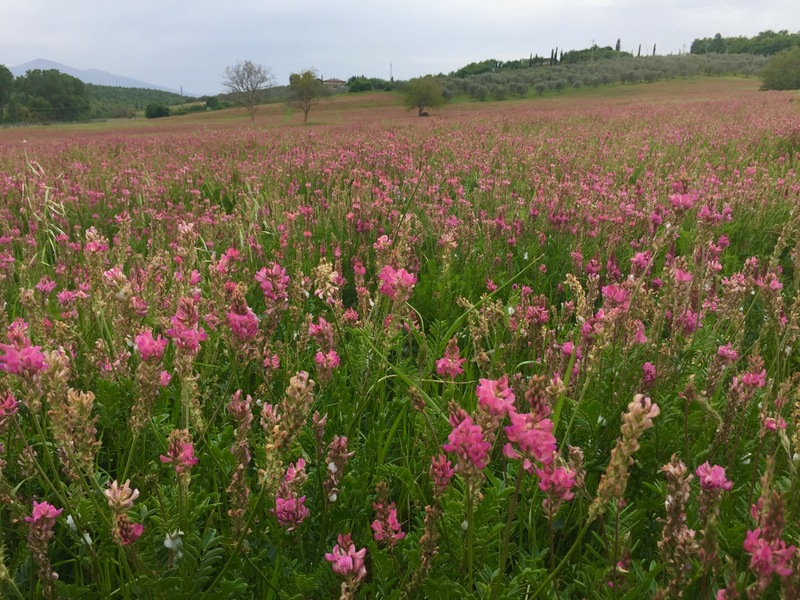 Sainfoin is very palatable and is grazed by livestock in preference to alfalfa. It is relished by deer. Although very coarse, the herbage is highly nutritious. Compared with alfalfa, forage dry-matter yields of sainfoin are about 20 percent lower under dryland conditions, and may be 30 percent or more lower in irrigated areas. Onobrychis species have never been known to cause bloat nor is it attacked by alfalfa weevil. It is highly palatable to both sheep and cattle, being preferred over alfalfa. It may be grazed or used for hay, either alone or in mixtures with grasses. Grows well with Russian wildrye and crested wheatgrass. Under irrigation, sainfoin is shorter-lived than alfalfa, but rotational grazing has been shown to prolong its life. Both Shosone and Eski varieties are well suited to hay harvesting as they grows upright and are easily cut. They are somewhat higher in moisture content than alfalfa. Since regrowth is very poor, they are best suited to taking one clipping at about the half- to full-bloom stage. Unlike alfalfa, they do not drop their lower leaves; stems remain succulent as the plant matures so that quality does not decrease so rapidly. Yield is often better than that of alfalfa for one clipping, but only 80 to 90 percent as high when two cuttings per season are compared. 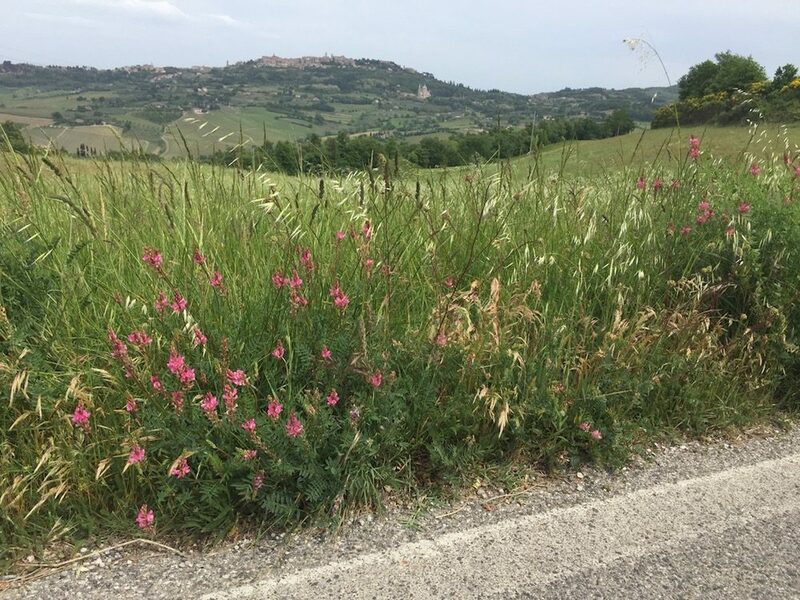 They compete poorly in mixtures with aggressive grasses and, although total yield is usually not affected, the proportion of sainfoin decreases. 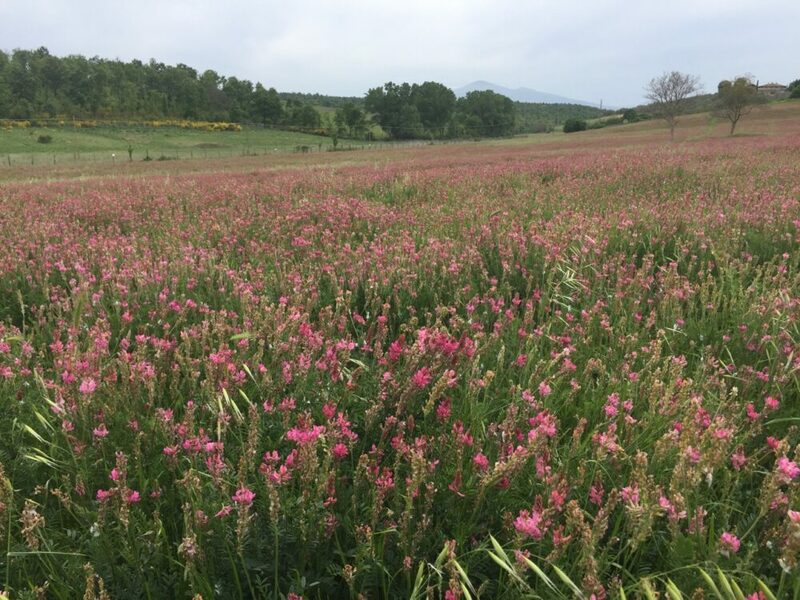 The advantages of sainfoin for pasture use include excellent quality and palatability that give superior animal performance without the danger of bloat. Compared with orchardgrass in irrigated areas, it yields about one-third less, regrows more slowly after grazing and has a shorter productive life. However, grazing in the bud or early bloom stage, and keeping the grazing height above about 8 inches, will lengthen productive life from two to three to about six years in irrigated areas. Sainfoin as a hay and forage crop can be planted in the spring or fall. Seeding depth should be between 0.25 and 0.75 inches. Establishment is improved when seeds are inoculated. We recommend GraphEX SA, available through our online store. Seeding rates for pasture plantings should be 30-35 pounds per acre. When Sainfoin is used as a component of a gangland mix seed 2 to 5 pounds per acre. This hay and forage crop should not be mixed with aggressive grass species. Both Shosone and Eski as hay and forage crop perform best if allowed to fully establish before grazing. Do not graze for two seasons after planting. Stands should be allowed to naturally reseed every 2 to 3 years for reestablishment. Stands will persist 3 to 6 years under irrigation but will last longer if root and crown rot diseases are controlled. Some plantings in Montana have survived for over 60 years and are still used for pasture. If you love flowers, we recommend you to check out here Suppleplant’s range of products for sale for orchids.